The milk chocolate that melts in your mouth, not in your hand! 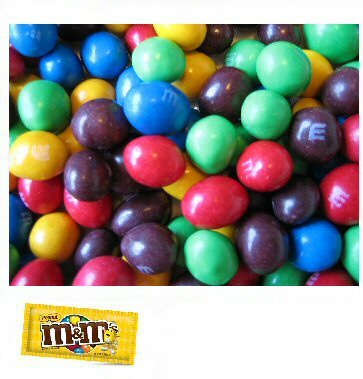 M&M's are candy coated pieces of milk chocolate that have a white letter 'm' printed on them. These chocolate peanut candies are loved all over the world and will be a big hit in any vending machine you choose to put them in. They are favored among young and old alike and come in 5 bold colors. (Blue, Yellow, Red, Green, Brown) This case is approximately 16lbs and comes in resealable pouches. When America entered the 1950s, M&M'S Plain Chocolate Candies were quickly becoming a household name, particularly with the growth of television. In 1954 M&M'S Peanut Chocolate Candies were introduced to the brand's portfolio and sales of both varieties continued to grow. That same year the universally loved M&M's brand characters and the famous slogan, "The milk chocolate that melts in your mouth, not in your hand! ", debuted in the initial TV advertising. Need a machine to vend these peanut candies? Be sure to see our full line of candy vending machines. Made by Mars, these candies typically vend for 25 cents in commercial vending machines that have an adjustable candy dispensing wheel which controls the number of pieces that vend per quarter. They will also dispense in our candy banks and dispensers. Candy is best stored in a cool, dry, low humidity location. Their shelf life can be up to 18 months if not exposed to extreme hot or cold temperatures. Email or phone for special shipping rates for HI, AK & International and pallet orders.